Nima Taleghani and company in Romeo and Juliet at Theatre Royal Norwich. Design, Tom Piper; lighting design, Charles Balfour. Photo: Topher McGrillis. Verona in 2019 is a grey, brutalist, harsh place and the fate of our Generation Z lovers feels more dark, more inevitable than ever. On a stark stage, a huge steel box dominates, as heavy and immovable as the selfish, inward looking world of the play. 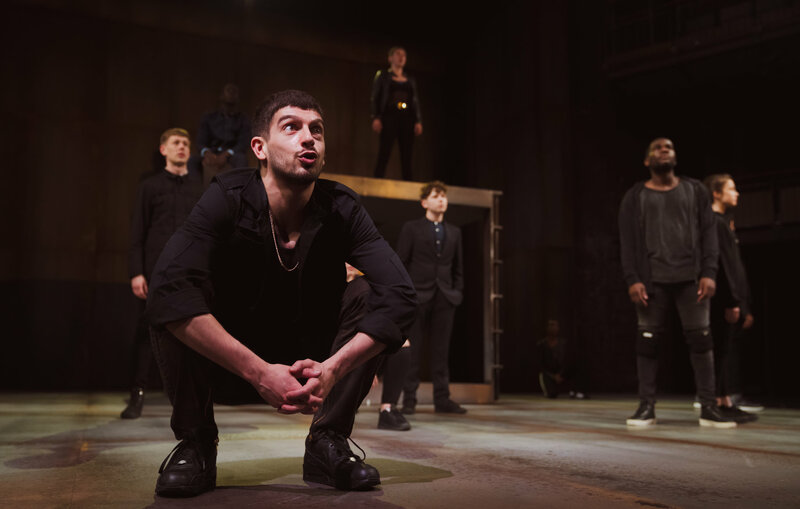 Director Erica Whyman’s RSC production creates a sharp, fresh vision of Romeo and Juliet that clearly seeks to reflect modern Britain, transcending the gilded frame of heritage theatre. Whyman’s production works on so many levels. It’s not just that some male characters are recast as women, or that there are an abundance of accents and ethnic diversity on stage either, it’s the timing of this tour. What feels the greatest tragedy on display here is the disempowerment of a generation at the mercy of systems designed to control and dismiss them. I was mindful that I was sitting in a theatre full of school age young people living in a feuding and divided Britain, watching a world out of control, where the rhetoric of hate “bred of an airy word” is currency. The adults have really lost it and Generation Z are looking down the barrel of a gun. But I’m getting ahead of myself a bit here. Like Romeo and Juliet, I’m no cynic. I believe in love. It’s a many splendoured thing, and like Whitney, I think love will save the day. And for a while, in this play there is a lightness that’s beautifully captured in Bally Gill’s Romeo especially. He has potential beyond the confines of his decaying world. He’s funny, kind, irreverent. His banter and physical play with Benvolio (a sweet and thoughtful performance by Josh Finan) makes the relationship seem real and full of history. This Romeo doesn’t take life too seriously, and his relationship with the audience is warm and human. Even the Rosaline thing seems a bit of a laugh, for once, making the fight at the start of the play a grotesque world away. Whyman recasts The Prince as a woman, and her lines about “men” and “beasts” take on a hugely explicit resonance. This truth merely hangs in the air, shrugged off by Lord Capulet especially. Men listen to each other, not women – however powerful they are. The rule of law may hold them, when enforced, but power is not given away easily. The entitled just bide their time and find other ways to flex their perceived superiority. Lord Capulet is horribly at ease with himself. Michael Hodgson’s performance in the role is always in control, even when he is out of control verbally and physically attacking his daughter. He simply reacts, asserting his dominance as is his natural right. Despite these bloody battle lines, echoing real life slaughter in our schools and city centres, putting women on the public streets of Verona feels revelatory. The very act of being on public display is where the personal and political meet, in the uneasy act of assimilation. Mercutio recast as female gives new insights. A female with agency and influence, who is listened to. Charlotte Josephine’s performance is magnetic and this interpretation of Romeo and Juliet really starts to take off with her entrance. Mercutio becomes a transgressive character, the best character in the play – funny, physical and dynamic. Mercutio’s Queen Mab speech is electrifying, the men hanging on her every word. The verse is muscular, naturally witty rather than show-off clever-clever. I don’t want to see Mercutio played by a man again. This makes absolute sense. I know her. Juliet, too, is a force of nature. As the imprisoned child of Lord and Lady Capulet, on the cusp of being sold off in an arranged marriage, there is a strong physical centre to Karen Fishwick’s performance. Juliet’s determination as she reaches the age of consciousness is apparent throughout. She wants to escape this world that suddenly reveals itself to her. And as she distances herself from this adult world that seeks to crush and control her, Fishwick creates a characterisation of total believability. As she wrestles with herself about taking the poison to make her feign death, the tension is unbearably palpable and in this production easily matches anything Macbeth or Hamlet has to offer. It is a horrific moment to witness. In an echo of Hamlet, the ghosts of Tybalt and Mercutio do not rest but linger on stage, bloodied and impassive, their deaths given weight as part of the system that killed them. Tybalt, a two dimensional personification of the feud, is given equal tragedy with Mercutio. The utter waste is emphasised. One of the triumphs of this production is its pace and urgency. The prologue still ringing in our ears, performed by the whole cast makes it feel more like a parable than a play: the sins of the adult world inevitably visited on the innocent. And when wars end, grand gestures from its architects, like a gold statue, remain just that. Romeo and Juliet plays at Theatre Royal Norwich until 2 February, before touring the UK until 23 March. More info here.